Farmer's Wife [E1634] - $11.00 : Yarn Tree, Your wholesale source for cross stitch supplies. 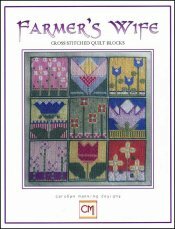 Cross stitch pattern of quilt blocks by Carolyn Manning Designs. Nine cross stitched quilt blocks with floral motifs. Stitch count 128 wide x 128 high.